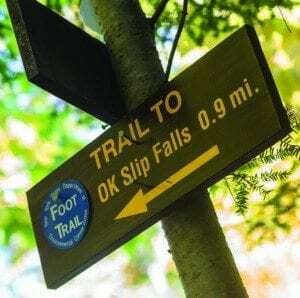 New hiking trail leads to a spectacular view of OK Slip Falls and to the Hudson River Gorge. A hiker arrives at the lookout for OK Slip Falls. Carol Fox had visited OK Slip Falls three times—twice in fall, once in winter— but not on the state’s new hiking trail and never with some guy jotting down every word she said. I advised her everything would be fine if she said clever and witty things. 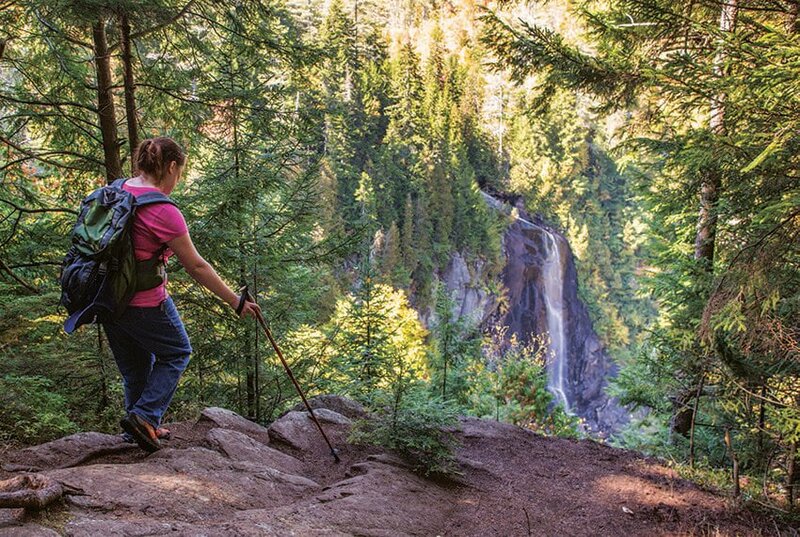 Mainly, though, I wanted to get her impressions of the trail and the falls, one of the highest in the Adirondack Park. Of course, she could describe the 250-foot cascade from her earlier trips. 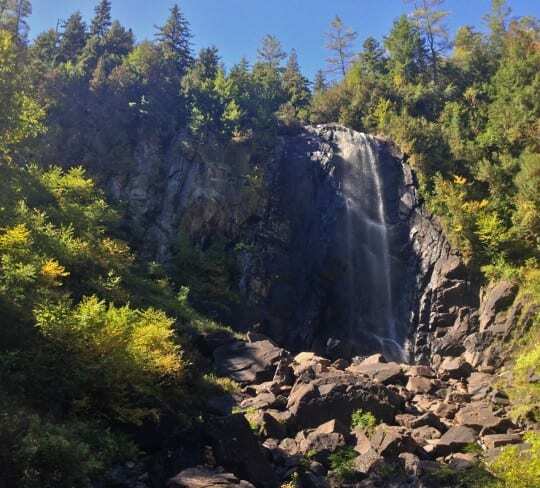 The state bought OK Slip Falls from the Adirondack Nature Conservancy last year, but it didn’t open a trail until this past summer. The conservancy acquired the falls in 2007 when it bought all of Finch, Pruyn & Company’s 161,000 acres for $110 million. The OK Slip parcel is now part of the Hudson Gorge Wilderness Area. Until the state purchase, the waterfall had been off limits to the general public for more than a century and had achieved an air of mystery. It’s no wonder, then, that the falls has become a popular destination. When Carol and I arrived at the parking area on a gloomy Saturday morning, there were already four or five cars even though the forecast called for rain. We weren’t about to be deterred by the weather. As a member of the conservancy board, Carol was privileged to visit the falls before the hoi polloi, but she was excited to see the new trail. So was I, because people had been asking me if the trail is difficult. Since I’m the editor of the Adirondack Explorer, they figured I should know, and now I can tell them: it’s not. The round trip to the falls is six miles, with only minor changes in elevation. In fact, the trail is mellow enough that with sufficient snow cover it would be fine for skiing. The giant cataract is an impressive sight when it’s turned to ice— something to keep in mind with winter around the corner. 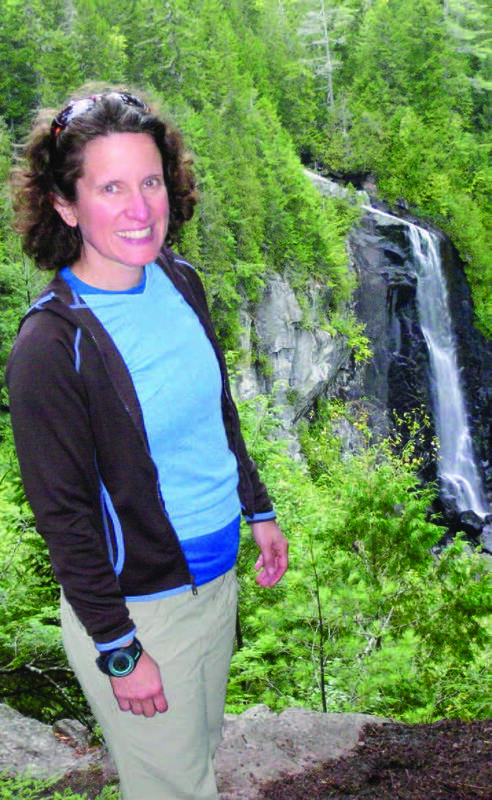 Hikers seeking more of a challenge can extend the outing by continuing on a second trail that goes from the falls to the Hudson River. Round trip, this adds nearly two miles. It entails a steep descent to the river and a short but stiff climb on the return. This trail seems unsuitable for skiing. Carol Fox at the lookout. Carol and I hiked both trails for a round trip of nearly eight miles. If you hike to the river during whitewater rafting season (April to October), you may see a flotilla of colorful rafts and hear lots of hooting and hollering. The rafts pass through this part of the Hudson Gorge around midday. 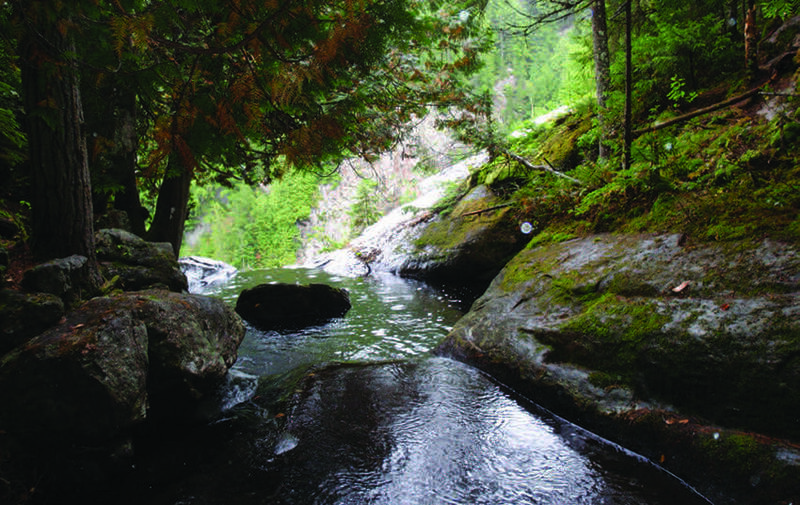 You’ll find the parking area for OK Slip Falls between the hamlets of North Creek and Indian Lake, on the south side of Route 28. From there you walk west about a third of a mile along the road shoulder to the trailhead, which is on the opposite side of the highway. For the first 0.8 miles, the route coincides with an older trail, marked by red disks, that leads to Ross Pond. Except for a muddy swamp near the beginning, this trail is easy walking through a handsome forest with big trees. Carol and I had not gone far when we saw a red squirrel on a spruce branch just above our heads, gnawing furiously on a cone and oblivious to our presence. I pulled out my notebook. “Are you going to interview him?” Carol asked. “Have you seen more foot traffic here in recent weeks?” I inquired, addressing the squirrel. Soon after, we came to a sign at the junction with the new trail. We turned right and followed it for 1.4 miles to a dirt road that leads to the Northern Frontier Camp, a woodsy retreat for boys on OK Slip Pond, a private in-holding. At 1.6 miles from the trailhead, after crossing a stream and passing through a hemlock grove, we came to an old beaver pond that has largely drained, leaving a wet meadow. When we reached the dirt road, at 2.2 miles, a DEC sign directed us to turn left. We walked up the road for 250 feet to another sign, which directed us to turn right and re-enter the woods. For more than a half-mile, we walked along an old woods road, now overgrown. At 2.8 miles, we veered left off the woods road onto another section of new trail and then descended in two short switchbacks to an overlook with a spectacular view of the falls. Looking across the gorge, we watched in fascination as OK Slip Brook slid off a bedrock shelf, plummeting amid evergreens in a silver ribbon. Two couples were enjoying the sight, and a third couple would arrive before we left. There is a second outlook about seventy-five feet away. It’s not as good as the first but still worth checking out. Carol and I lingered here for a snack. As we sat, we were entertained by a chipmunk that, after several nervous sorties, finally worked up the courage to approach us. While at the outlooks be careful near the edge as the drop is long and precipitous. Parents will want to keep a sharp eye on young children. Also, take note that an informal trail that descends from the second overlook into the OK Slip gorge is closed, both for the sake of public safety and to protect natural resources. Despite the threat of rain, Carol was game to hike to the Hudson River. The Northern Frontier Camp created this trail years before the state bought the property. All DEC did was mark it with blue disks and put up a few signs. In the future, however, the department may reroute the steeper sections. The trail begins just before the overlooks. Leaving the junction, we crossed a small stream and then came to a junction with a trail that leads to the boys camp. It’s closed to the public. Bearing right, we descended briefly to a footbridge over OK Slip Brook. From the bridge we watched the brook as it disappeared over the ledge at the top of the falls. OK Slip Brook disappears over the ledge at the top of the falls. After crossing the brook, the trail climbs (not steeply) for less than a quarter-mile to a height of land. During the ascent, we caught glimpses across the gorge of the overlook cliff whence we had first viewed the falls. By now, it had started to rain, but the forest canopy kept us fairly dry. The descent to the Hudson River is gradual at first but eventually becomes quite steep. The trail ends at a campsite near the mouth of OK Slip Brook, next to a nice beach and just upstream from OK Slip Rapids. Carol and I stayed long enough to watch several rafts drift downriver into the rapids. Coincidentally, the next day we took a commercial rafting trip ourselves and stopped at the same beach. Hiking to OK Slip Falls and rafting the Hudson Gorge makes for a great weekend, but it’s possible to do both on the same day. Square Eddy Expeditions, an outfitter based in North Creek, will pick you up in a raft at the end of the Hudson River trail and take you through a number of exciting rapids en route to a takeout in the hamlet of North River. If you’re looking for full-on Adirondack adventure, this is one way to find it. It was still raining as we hiked back to the trailhead, but we passed several people going to OK Slip Falls. 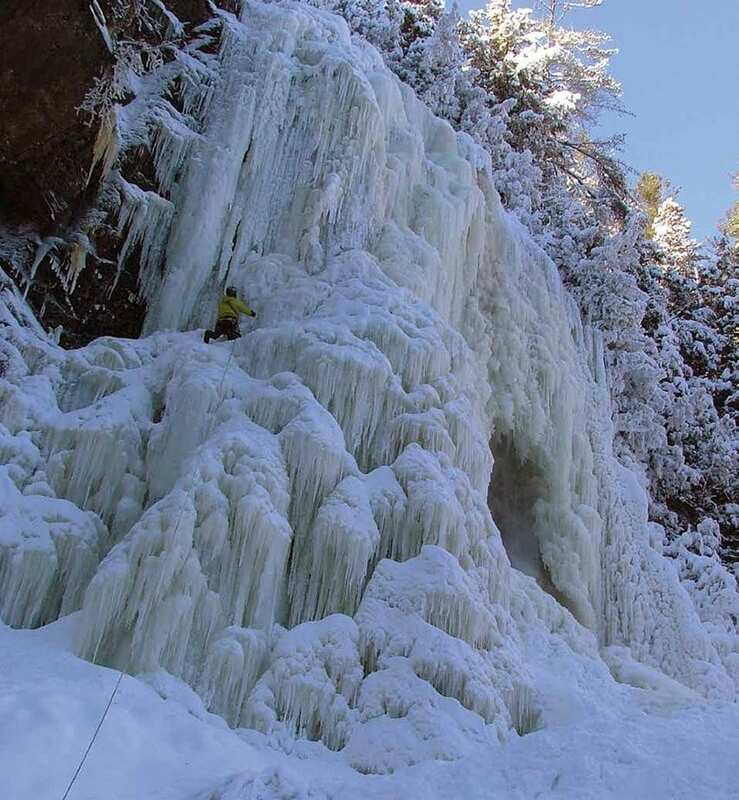 Like us, they would not be deterred from seeing one of the tallest cataracts in the Adirondacks. And then it occurred to me that I had failed to elicit a purple quote on the sublimity of this magnificent landmark. I mentioned this to Carol. 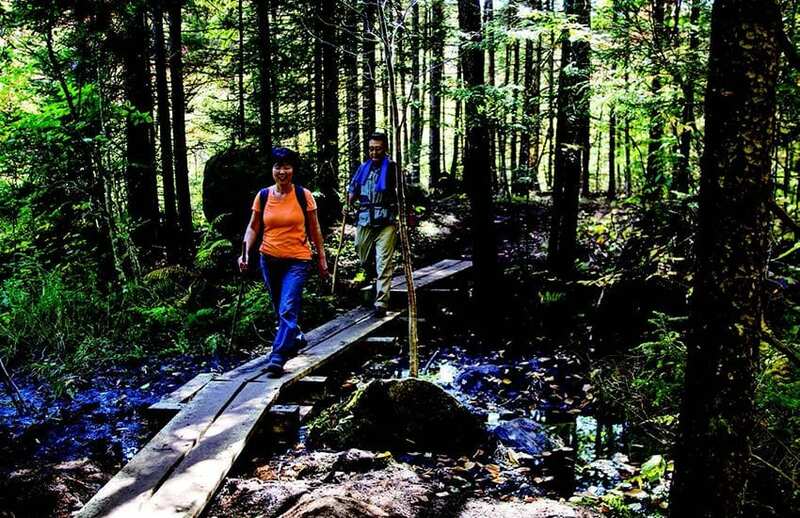 On their way to the falls, two hikers cross soggy ground on a boardwalk. “I didn’t serve a purpose on this hike if I didn’t provide a good quote,” she remarked. “That’s OK,” I told her. “I’ll make something up.” In truth, a thousand words would not do it justice. DIRECTIONS: If coming from the east, drive west on NY 28 about 10 miles past the first turn for North Creek and look for a parking area on the left side of the highway (a sign about a quarter- mile beforehand lets you know the parking area is coming up). If coming from the west, the parking area will be on the right 7.6 miles past the NY 28/NY30 junction in Indian Lake. From the parking area, you walk west along the highway for a third of a mile. The trail starts on the opposite side of the road. Hiked with a small group yesterday to OK Slip Falls…absolutely beautiful falls and surrounding woods!!! Thank you! The hike to OK Slip Falls has been a staple of camp life at Northern Frontier Camp since I was a camper there back in the 70’s. Glad it’s open to the public now. I find it interesting that the state DEC signs indicate that from trail head to the falls it’s 3.5 miles. Considering the twists, turns, and (I agree with the author) the steeper portions of the trail, I would say hit the trail with snowshoes instead. Hiked this 2018,mid week,very few people on the trail,had the falls viewing to myself.. I’m happy I waited for the rush traffic to settle down before going,absolutely clean trail….no litter. Interesting trip! Did it years ago in reverse while paddling to North Creek from Indian River launch site. Brigade Camp,” which owned some of the tract years ago….worthwhile hike for not a lot of effort!